“Custom” means made to customer’s specifications, with feature’s just as requested. This atypical Dragon Leatherworks holster shows why people choose individually designed products. The gun it contains, by the way, launches entirely serious .452″ projectiles. This entry was posted in holster, pistol and tagged leather, revolver. Bookmark the permalink. I’ll bet there’s matching chaps. Hey if the customer is happy, all good. Knowing the owner, I would not be surprised. No accounting for taste, I guess. Owning one of Dennis’s Fuglys (which is as far as one can be in the Opposite Direction as that Holster), even though it’s not to my taste, I GUARANTEE the Quality is Top Notch. Actually if this is the same gun I handled, it’s a Model 25 in .45 Colt, not ACP, so 0.454″ but what’s two thousandths between friends! It probably is. I didn’t get a good look at the revolver itself. Understand the idea being portrayed, but to me, its execution is silly. 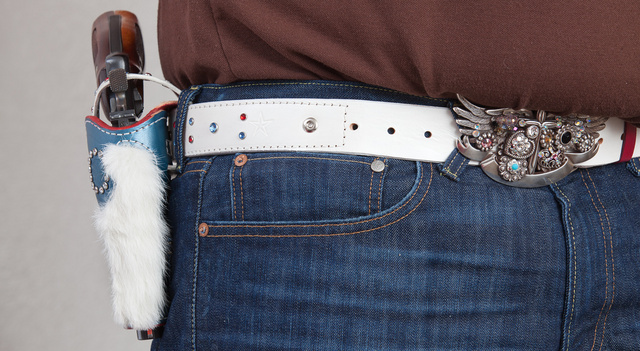 1) The original copy of this holster was made in April 2013 for The Colbert Report on Comedy Central. Along with doing custom holster work, I do custom hand-made leather goods for TV and movies. 3) For those who don’t know (and if you don’t, you’ve got some serious catching up to do) Ray is an openly gay male. 4) The conversation with Ray turned to the potentially lucrative LGBT community, the majority of which appreciate high-quality hand-made goods. Especially those doing guy-as-a-girl-as-a-guy performances (Think Victor/Victoria) who have a hard enough time as it is finding quality costuming, let alone costuming that can also be quite functional. So, the *idea being portrayed*, for the original copy made for Stephen Colbert, was (at the request of the prop master for the show) something red/white/blue, over the top, as gaudy as I could make it, with the addition of some sort of real fur being a plus. Hence the white rabbit fur. As for the second copy (Ray actually now owns the only other copy in existence aside from The Colbert Report show) Ray saw the picture, and in it saw something that would be functional, that he could show off at Gay Pride events, and that, given the setting he intended to wear it in, would help to open new avenues of revenue for my company, along with providing to an under-served demographic, a high-quality hand-made leather good that was fairly priced. It’s so wrong that it’s actually kinda awesome. I thought he was a Texan!!! I’m not joking. 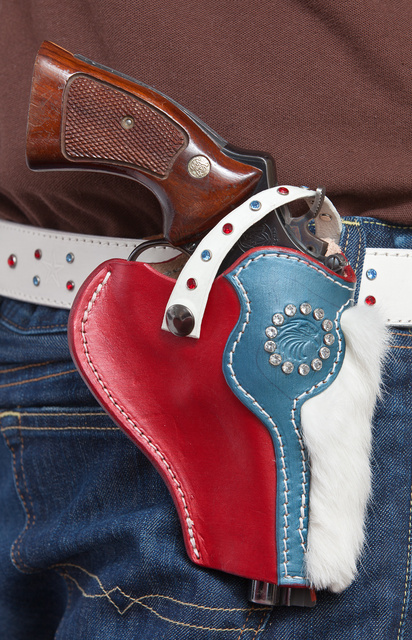 I saw this holster and immediately thought of getting a few for some friends in Texas with a star in the middle instead of an eagle. Oh, well. Gay and Texan are not mutually exclusive, and only one of them is contagious. I thought Tam had won the thread (again) with her comment above. But after a brief moment of thought I have to say that any world where that holster can exist, and exist as more than a one off joke, is in better shape than many fear. Nice work, but needs pearl-handled grips! Ray I have some for a S&W (I think…) – are you coming to the rendezvous again?